Live-work spaces: why so few? Millions of people in North American cities have home-based businesses, but we’re restricted from using our homes as production, distribution or employment centres, and in most cases, we’re even forbidden to put up a sign. The “Tin Town” district in the city of Courtenay, B.C., on Vancouver Island, is an exception to this rule. I recently attended a social gathering in a solid, well-appointed upstairs apartment on Rosewall Crescent, in an area zoned “Industrial” on Courtenay’s land use map. Nearby, one can find the Freakin’ Coffee Shop, the All in One Party Shop, the Sirius Beauty Dog Spa, the Soap Exchange Refill Centre, Klitsa Signs, Stand Up Paddle Boarding, Gemini Dance Studios, a marriage counsellor, and a handul of art and design studios that may dabble in sculpture and metal work. In several cases, people live in the same aluminum-clad unit where they do business, or in an adjacent unit. The success of this development, now in its second decade, shows that some people (at least in Courtenay) are willing, or happy, to live alongside an unpredictable mix of production and distribution activities. It’s like the Hollywood version of the Old West, where blacksmiths, wagon-fixers and printers work in the gaps between residential hotels and rooming houses. The theory of how cities can create live-work options has been elaborated in detail — for example, by the Live/Work Institute of Oakland, California — but B.C. municipalities, developers and consumers don’t seem interested. 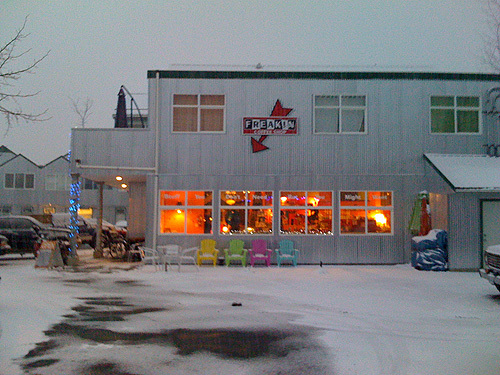 I have found a single suburban online reference to “live/work” in Fraseropolis: the City of White Rock approved six live-work units in 2000 (see appendix 6 in the linked file), each with a modest 250 square feet of permitted arts studio or professional space and (judging from Google Images) no commercial signage. The City of Vancouver has permitted the construction of a considerable stock of live-work units for working artists, many in the Gastown and Main/Kingsway districts. But these spaces, often located in old industrial buildings, are also highly desirable among affluent trendsters who can out-bid the starving artists for whom the space is supposedly intended. The above quote is from a 2011 City of Vancouver staff report [link unavailable] on the live-work issue as it affects artists. The report, based on consultations with artists, resulted in the creation of a live-work studio program for artists, with a small number of city-owned paces leased out through an application process.. The documents suggest that live-work space is a niche market that is difficult for developers to get right, and it’s expensive to build. And, I would add, if live-work development is done on a Tin Town scale, it will bring trucks into residential areas (see Fraseropolis for November 24, 2011) and create competition for residential parking spaces. I’m learning from my neighbourhood association work that many homeowners, especially those in detached homes, are zealously territorial about “their” on-street parking spaces; I have to conclude that this is a key driver in preventing mixed land use in Fraseropolis and across the continent. If we’re going to reduce our carbon footprint, create jobs closer to home, etc., it’s clear that we have to tighten up our cities and get serious about mixed-use development. Tin Town seems to show that a jumble of industrial, commercial and residential uses can function, and even generate strong neighbourhood pride; even with the obstacles noted above, it’s strange that we don’t see more such examples. Great post Ian. Completely agree with you re cities needing to get serious about mixed-use development as well as a better understanding of the creative class – a major contributor to our local economies. Thanks, Lori. This post was triggered in part when I learned that our friends Robert (musician/music producer) and Cailin (musician/graphic artist) were talking about how they might find a live-work space in suburban Metro Vancouver. My thought was that they may have to take on new roles as property developers. The quote I heard a couple times about Maple Ridge during the recent election campaign was that around half of business licences were issued to home-based businesses. This totaled 1,586 home-based businesses in 2010. Admittedly at least some of these businesses, like mine, are a second job. A number of years ago, when I was working for myself full-time, and with two kids at home, we needed more space for my office. We looked at the costs of leasing office space in Maple Ridge as compared to renovating our home. We ended up renovating, adding a large home office including a work area, meeting area, and kitchenette. I’m now working part-time in Vancouver but have never regretted adding this office space. The benefits of having more time available for family is priceless: partly due to less commute time but also just being able to take a 10 minute break at the end of the school day to talk to the kids as they arrive home. I am in the software development business (“intellectual production”) so I don’t normally require deliveries; I usually go to my client’s offices, either virtually or physically; and don’t have the need for a sign. As a result, the presence of my business does not impact my neighbourhood. Robert and Cailin, as you mentioned, are a good example of the owners of a house that fits the needs of their careers and lifestyle, but is a very different solution from what we have. I suspect that there are probably many more local examples of people adapting their homes to effective live-work spaces and staying with the current zoning and business regulations. I don’t think that building the right space to fit the needs of a particular family and their business is necessarily best done by a developer, or needs to be restricted to a particular zone within a municipality, Decisions are better made by the individuals involved, in consultation with the municipal building department staff and their neighbours. Municipal governments should be open to supporting appropriate projects, with the support of the adjoining neighbourhood, by providing exceptions to zoning regulations and providing planning advice for neighbourhood concerns about issues like noise and traffic. It may well be worthwhile for the Maple Ridge Strategic Economic Initiatives Department and the Pitt Meadows Economic Development Corporation to have profiles on-hand of some effective, local live-work spaces to present as ideas to people interested in starting or expanding small businesses to get them thinking about alternatives to more traditional business locations. Thanks for taking an interest in this topic, Alex. It’s clearly the case that more and more people are earning some or all of their incomes from their homes. Your advice about creating more home office space vs. renting outside the home will be valid for many people. This surely has implications for transportation and land use, but I can’t say I’ve heard much discussion on the subject. In my post, I’m trying to go a step further. You and I go to client meetings off-site; but at a certain threshold of business activity, it might be beneficial to be able to integrate a workshop or a showroom with our offices, and have employees and customers come and go. There are grandfathered examples here and there around our community — a portrait photographer with a sign on his lawn and customer parking by his back door, a familty funeral home with a live-in suite above the front office. The classic example across Canada was the neighbourhood grocery store with the owner and family living upstairs, but guess what: we aren’t permitting the establishment of neighbourhood grocery stores in most of our new neighbourhoods. In fact, it seems most suburban neighbourhoods are closed to the idea of hosting commercial-scale businesses. I suggest, without being an expert, that the least controversial locations for adjoining residential/commercial units would be a downtown core or the edge of an industrial zone. There might be a market, there might not; I get the impression that Tin Town’s builder was simply a local guy with a crazy idea that worked out. There is a currently a project being built on Lougheed Hwy at 223 Street in the downtown core, Urban Green Maple Ridge Downtown (see http://www.urbangreenmrdt.com/). The first floor will be retail space and five floors of residential space above. This differs from what you are describing in that the people who are working in the retail space below won’t necessarily be living in one of the apartments above. But it does demonstrate a gradual change in thinking about mixed use projects. I think we will see more projects with a mix of commercial/light-industrial and residential uses but initially it is far more likely to find a residences appearing in areas that have been strictly commercial or light-industrial and not the other way around. We can see this happening in Vancouver/Burnaby along the Hastings and Cambie Street corridors. Neighbourhood shops like Stomping Grounds Coffee in Osprey Village or Kanaka Creek Coffee on 102nd in Maple Ridge have demonstrated additional benefits to the neighbourhood by also become a gathering place for the community. Kanaka Creek Coffee hosts a popular “open mike” music night on Wednesday evenings and Stomping Grounds has offered live musical entertainment on some Friday evenings. I have been in Chemanius on Vancouver Island a number of times for an annual cycling event. One year, when I was there, I had an appointment with a local Chiropracter. He had his office at the back of his house, with patients coming and going throughout the day. This type of arrangement seems to be much more common in small communities than in places like Metro Vancouver. As many people try to adjust their lifestyles to reduce their automobile use, either for budgetary or environmental reasons, there will be more demand for neighbourhood grocery stores and other small-scale shopping or services in areas that are currently strictly residential. Your article came up in a search for live/work opportunities on vancouver island. 🙂 As a single, work at home , home schooling mama artist, I would imagine we could create a lovely mix of this ideal and affordable housing cooperatives and create new communities within communities.. Where do I sign up please?! I’ve been thinking about the benefits of the lowly corner-store as well, something which seems to have been zoned out of existence in the suburbs. The bylaws which would prevent enterprise in residential areas, also closed the door on ones ability to walk a few block from your home to get a loaf of bread and a dozen eggs, rather than fire-up the F150 to go to the Superstore. In amongst the sprawling tracks of suburban housing, surely one corner lot could be allowed to operate as a small retail store/residence. How about a bakery in someone’s converted garage? How offensive would it be to have the smell of croissants wafting thru the neighbourhood in the morning? The San Juans are facing a crisis which many folks here, I don’t think, even see yet: the fact that our young people are leaving, and that younger people don’t seem to want (or be able to) move here. I suspect that your Gulf Islands might be seeing a similar trend. The original ‘back-to-the-landers” and retirees are growing old and moving on to easier lives, and we’re not replacing that energy with new folks. We’ve also seen the collapse of the second-home building industry — which used to be the next most important sector of our economy, after tourism. With the loss of construction jobs went most of the good paying work on the Island. Land prices, however, haven’t really gone down that much, at least not enough to make buying & building affordable for working folks. Most of the non-retired, non-government employed people here own or work for small businesses: restaurants, artists, small shops, landscapers, farmers, etc. It’s hard enough for working people to afford a home, let alone a home AND a studio/workshop/office/small retail shop. The model of Tin Town, I believe, allows the owner/renter to have both in a connected space. This model is fundamentally different from the “new urbanist” developments where the ground level retail/office is owned/leased separately from the upper level residences. All this is background to the idea that exurban-rural areas like the island communities need to do much more to attract & keep small businesses & younger folks, and I think promoting construction of affordable live-work spaces could be a huge step towards making that happen. Thanks for exploring this idea, and I look forward to reading more of your thoughts. Thanks so much for that insight, Adrienne. In the Gulf/San Juan Islands — and other locations around Cascadia and North America with similar demographics — there should be lots of incentive for local folks and local governments to push ahead with this kind of model. I hope to return to this subject before long.